Your choice to invest in Juniata means you believe in the promise the College embodies. Juniata College relies on its alumni and friends to provide for its long-term needs. The future of Juniata is dependent upon endowment contributions, funds that will continue to generate income year after year, making sure that educational opportunities and vital programs will remain in place for future generations of Juniata students. Planned gifts can be a wonderful way to help the College increase our endowment. By choosing to fund an endowed scholarship, professorship, or program, you are demonstrating that you believe in the promise the College embodies. It means you understand how your gift, stewarded over the years and decades to come, can help scores of students to lead lives that have a positive impact on thousands of other people. Why are we focused on building the endowment? Simple. To take a line from the world of sports, for years Juniata has essentially competed outside its weight class, competing against schools with double our endowment. We've won recruiting battles, competitions for faculty, and the admiration of many. But anybody knows that underweight competitors can not stick it out for the long haul. How does endowment help a college? The endowment provides financial resiliency by investing contributed capital and spending the income in ways that advance our mission. Such resiliency will become ever more critical in the coming years, as Juniata navigates through the changing environment in higher education. Individuals make gifts to endowment in two ways - they either give to an existing endowment or establish their own. Outright gifts of cash, appreciated securities (stocks, bonds, and the like), planned gifts (through a will, or annuity, for example), or real estate holdings can be used to establish an endowment or to support an existing fund. Individuals can choose to support or establish scholarships, professorships, or programs. Within those three broad categories, many options exist for those wishing to help Juniata, its faculty, and its students. 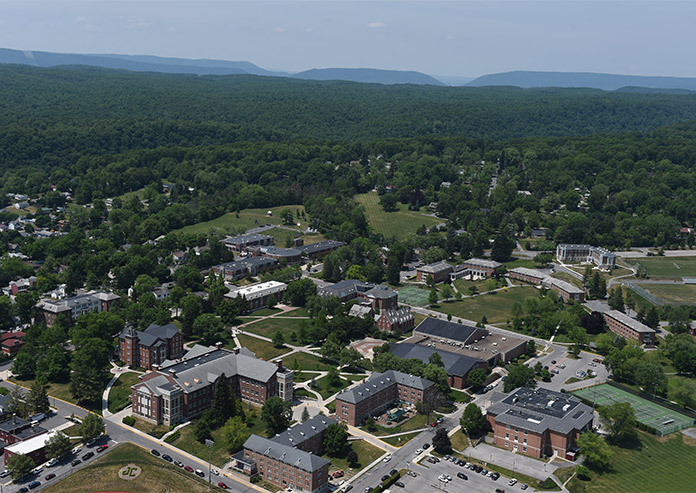 Juniata's overall endowment is constituted of money given by alumni, friends of the College, and parents of current and past students that is then invested. The sum of that money, or the principal, is placed in the College's investment portfolio and managed so that it continues to generate income, supporting future generations of students. The College only uses the interest the endowment principal earns, ensuring the principal will continue to work indefinitely. The College's investment policies are structured to enable Juniata to satisfy donor goals and to generate sufficient interest over time to grow the principal, keeping pace with inflation. A pledge may be accepted for the establishment of a named endowment. The term from the time the first pledge payment is recorded and the time that the final pledge payment is received must not exceed five years. What Effect Would Endowment Have? Consider this: internships, study abroad, and student retention programs like InBound are proven to add significant value to a student's experience. Why don't more students take part? They need summer jobs to help offset college costs, and can't afford to lose a week, or a month, or a summer to enrich their lives. Endowing those programs would provide, for instance, stipends to help offset income losses for deserving students so they could take part. How Does a Gift for Endowment Work? A gift to the endowment fund is a gift to Juniata's future. This money is the principal in the College's investment portfolio that continues to generate income, supporting future generations of students. Only the interest is used by the College, ensuring that the principal will continue to work indefinitely. The College's investment policies are structured to allow the College to satisfy donor goals and to generate sufficient interest over time to grow the principal, keeping pace with inflation. View the amounts required to create an endowment. What exactly is “the endowment”? Juniata’s endowment is actually a collection of more than 530 individual endowments, including more than 320 scholarship funds, 27 professorships, and numerous endowed program funds that support learning resources as various as lectures, library acquisitions, internships, and the Baker Institute. Endowed funds have varying degrees of restrictions, since donors specify the uses of the proceeds that result from the endowments they create. How do endowed funds survive changes in the economy? Juniata preserves the original gift in its endowment in perpetuity, spending only a portion of the annual income (usually around 5 percent) and returning any other earnings to the principal as a hedge against inflation. Thus, the benefactor who makes an endowment gift today knows it will support its intended purpose far into the future. How important are endowed funds? The College depends on endowment contributions—funds that continue to generate income year after year—to ensure affordability for our students, to provide greater ability to attract and retain great faculty, and to strengthen the vital and defining programs that have made and will continue to make Juniata distinctive. How is an endowment different from annual giving? Annual giving supports priority needs, primarily the Juniata Scholarship Fund. Endowed giving, however, ensures that funds are available for long-term strategic impact. While Juniata Scholarship Funds are spent as they are received to support scholarships for talented students with need, endowed funds are invested as described above. Can I establish an endowment and support annual needs? Most donors who establish endowments also support annual needs. Think of it this way: For most people, establishing an endowment is their legacy to the College. Annual gifts to the Juniata Scholarship Fund support a common priority of all Juniatians—helping to make a difference in the life of a student today while keeping education affordable. Some Juniata Scholarship Fund donors have already made plans to endow their annual gift through their estate planning or deferred pledges. If you’re doing the math, a $50,000 gift to the endowment would ensure a yearly scholarship of $2,500 that would last forever. Both annual and endowed giving are critical to Juniata’s future. Individuals have several options for establishing endowments, but the process is ultimately the same. A donor provides capital to invest so that the yield from the investment is sufficient to cover the purpose. For instance, the average Juniata scholarship is $2,500. To establish an endowed scholarship equal to that requires a principal investment of $50,000, so that it will yield, at 5 percent of a 12-quarter moving average, about $2,500 to use for the scholarship. The individual can provide the capital various ways. You can provide cash outright, transfer stocks or appreciated securities, name the College as the beneficiary of a will, trust, retirement assets or an insurance policy, make gifts of real estate, and more. Do I need to fund my endowment all at once? No. You may pledge to make payments for up to five years to fund an endowment. Endowments do not pay out to designated purposes until they are fully funded. Can I add to my endowment later? Yes. Individuals can make gifts to add value to the principal at any time. Others also may add to your endowment, and often do so as anniversary gifts, birthday gifts, retirement congratulations, and the like. You can also make plans in your estate intentions to add value to any existing endowments. If I make plans to establish an endowment at Juniata in my will, does the College need to know of my intentions? Strictly speaking, we do not need to know what’s in your will; however, if you let your intentions be known, we can provide advice or recommend options for estate planning, which is helpful to all those involved. This also allows the College to discuss with donors whether duplications or pre-existing resources exist to satisfy the need. How does the College use the money generated by the endowment? Many endowments are established by donors who provide stipulations regarding their use. For instance, a donor may indicate that her scholarship is to support students from rural backgrounds, or a professorship is for a historian. Those stipulations, recorded in writing and signed by the donor and representatives of the College, are termed “guidelines,” and are kept as reference and instruction in perpetuity. Others provide support through unrestricted endowment, giving the College flexibility for addressing future priorities. Unrestricted endowment provides the College great flexibility in addressing future opportunities and is one of the most helpful gifts a person can make. Endowment guidelines ensure your gift will be used exactly as you want. They outline general or specific criteria and may include background information on why your gift is important to Juniata. Thus, even as staff of the College may come and go, the legal agreement guiding your endowment remains and ensures that your intent is honored. A development officer can assist you in drafting the guidelines. Who decides how the funds are invested and managed? Juniata’s Trustees have an Investment Committee that oversees the investment and management of the College’s endowment with input and oversight from professional investment managers with diversified investment strategies. As well, the College contracts for regular audits to ensure proper stewardship of the funds entrusted to Juniata. How do I know my gift is having an impact on the College and its students? That’s our responsibility, and one we take very seriously. Juniata’s advancement office will provide you updates annually on the performance of the endowment and the specific uses of your fund. We will also make sure you have the chance to learn about the students and faculty affected by your generosity. If you ever have any questions, please contact us. Yes, and we encourage you to do so! Naming your endowment after a family member, respected faculty person, coach, or a business provides a personal connection for the recipient of your endowment gift. We will also continue to tell your story to future generations of students, faculty, and staff.